We dedicate this page to highlight heroic actions and noteworthy people supporting the cause of freedom around the world, and/or supporting those who serve. If you know of heroic actions and/or noteworthy people you'd like to see recognized here, you may nominate them using our contact page. An intelligence specialist serving with Headquarters and Service Company, 1st Battalion, 9th Marine Regiment, 2nd Marine Division, 2nd Marine Expeditionary Force, Boutwell is getting ready for an upcoming deployment to Iraq. He has spent the past four years recovering from severe injuries he suffered during a March 2004 attack in Iraq’s Anbar province, and then fighting for the opportunity to go back. 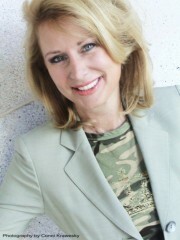 Melanie Morgan, San Francisco talk radio personality and chairman of Move America Forward (MAF), has earned a spot on our heroic actions page because of her staunch support of American troops. Based in the Bay Area, MAF has led the counter-protest efforts against Code Pink and the other wackos trying to shut down the Marine Recruiting office in Berkeley, California. They sponsored the "You Don't Speak for Me, Cindy Sheehan" bus tour that had Cindy and Company outnumbered outside President Bush's ranch in Crawford, Texas. And they sponsored a Gold Star Parents Tour of Iraq for parents whose sons and daughters gave their lives to liberate the Iraqi people and to protect America against a repeat of September 11. Please, take a minute to read about Melanie and MAF. We think you'll be as impressed as we are. What a way to celebrate Independence Day! 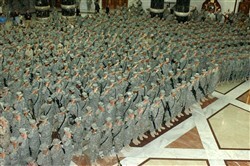 As Americans enjoyed beaches and backyard barbecues for the 4th of July, nearly 600 US service members in Baghdad took the opportunity to celebrate their own freedom by re-enlisting on July 4 in Saddam's Al Faw palace. In what was surely the largest re-enlistment ceremony in the history of the US Armed Forces, 161 of them also became US citizens. 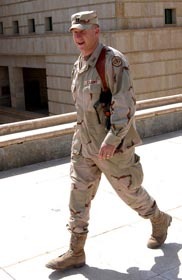 Army Gen. David Petraeus, commanding general, Multi-National Force Iraq, pointed out that the troops who re-enlisted on Independence Day, most while serving on a second or third deployment to a combat zone, have made a decision based on far more than any bonus they may receive. Arizona Senator John McCain provided congratulatory remarks on behalf of the U.S. Senate. The heroic actions of Senior Master Sgt. Elizabeth Melahn, deployed in Afghanistan, recently earned her the gratitude of Afghan citizens. Melahn donated $1200 from her own pocket to purchase 1500 liters of heating fuel for Afghan women and children. When stymied by attempts to get funding from official sources, Melahn phoned her husband, Chief Master Sgt. Jeffrey Melahn, stationed at Barksdale AFB, LA, and asked for his blessing to donate the money to help these women, most of whom are widowed, and their children. Melahn is currently serving as the Afghan National Army Embedded Training Team S4 mentor. Gen. Myhammadzai Khatul, the only female general in the Afghani military, was nearly overcome with emotion at the generous personal gift of the American airmen, which provided 10 liters of heating fuel for 150 families. Melahn's interpreter, who has been working with the US Army and US Air Force for about five years, called her "the greatest person I have met ever." The Melahns' donation inspired Barksdale's Chapter 615 of the Air Force Sergeants Association to donate another $2000 for heating fuel. “Suzan” an Iraqi woman and lawyer whose full identity was withheld for security reasons, served as a guest speaker at Camp Taji, Iraq, recently, for a celebration in honor of “Generations of Women Moving History Forward.” As Suzan expressed her views that the participation of Iraqi women is necessary to ensure that they enjoy the freedom they desire, the second class of female Iraqi soldiers was undergoing training at the Jordanian Royal Military College. Although Iraqi women have traditionally been kept out of sight, they are slowing gaining hope of achieving equality. Progess is being made in Iraq, emphasized Suzan, but the mission is not over, and there should be no rest until the mission is complete. It is through the heroic actions of women like Suzan and these Iraqi women who volunteer for their new Army that Iraqi women will become free to pursue their own dreams without rejecting the traditions and customs they hold dear. Army Capt. David M. Rozelle lost his right ankle and foot as a result of injuries he suffered when his Humvee was destroyed by an anti-tank mine during the early days of Operation Iraqi Freedom. Captain Rozelle worked hard to become qualified for return to duty, and did so just nine months after his traumatic injury. 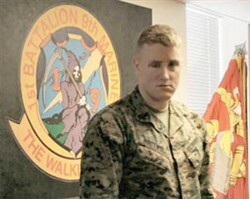 He became the first amputee to return to duty in a combat zone. He says his friends thought he was crazy for requesting such duty when he could easily have retired. (We say they don't understand what it means to be a member of the US military.) After finishing his tour in Iraq, Captain Rozelle returned to Walter Reed AMC to become a program manager for the Army's new amputee center there. "I will take the knowledge of what is required to return to theater back with me to Walter Reed," he said. What better role model for wounded warriors returning home? NEW! See our update on now-Major Rozelle! The American service member has never had better supporters than Zachary and Elizabeth Fisher, the New York couple who founded Fisher House Foundation. Zach Fisher was born in Brooklyn to a Russian immigrant family. At age 16, he dropped out of school to work in the family construction business. Later, Zach teamed with his brothers to create Fisher Brothers, a construction company that built and owns more than 5 million square feet of office space in Manhattan and elsewhere. Prevented from serving in World War II because of a knee injury received on a construction site, Zach dedicated the remainder of his life to supporting America's service members and their families. 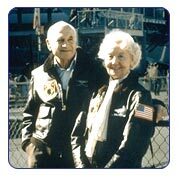 In addition to being personally responsible for the creation of the Intrepid Sea, Air & Space Museum in New York City, Zach and Elizabeth Fisher donated more than $20 million dollars to create the Fisher House program. Fisher Houses are "comfort homes" (similar in idea to Ronald McDonald Houses) built on the grounds of major US military and VA hospitals to provide a place where military families can stay at minimal or no cost while a loved one is undergoing treatment. Such homes were a long-time dream of Mrs. Pauline Trost, wife of Admiral Carlisle Trost, USN (Retired), who was Chief of Naval Operations when Mrs. Trost recommended the idea. The Trosts and the Fishers were friends, and when Zach Fisher asked ADM Trost if he knew of some other way they could help military families, ADM Trost told Zach of Pauline's vision of a home where military families could stay near military treatment facilities. And Fisher Houses were born. For many years, Zach Fisher and his brothers anonymously donated amounts ranging from $10,000 to $25,000 to the families of NYPD and NYFD personnel killed in the line of duty. They also made donations to each of the families of the Marines killed in the Beirut bombing, and to other military families who lost loved ones in tragic circumstances. As an outgrowth of the Intrepid Museum Foundation, the Intrepid Fallen Heroes Fund was established, and in January 2007, it completed construction of a $55 million world-class state-of-the-art physical rehabilitation center at Brooke Army Medical Center in San Antonio, Texas. The “Center for the Intrepid” serves military personnel who have been catastrophically disabled in operations in Iraq and Afghanistan, and veterans severely injured in other operations and in the normal performance of their duties. The 60,000 square foot Center provides ample space and facilities for the rehabilitation needs of the patients and their caregivers. It includes state-of-the-art physical rehabilitation equipment and extensive indoor and outdoor facilities. The Center is co-located with two 21-room Fisher Houses that house the families of patients. Zach and Elizabeth Fisher, and the Fisher Brothers, have created a lasting legacy of support for America's service men and women, most of whom have never even heard their names. It's time we call attention to the patriotic and humanitarian spirit that lives on through their foundations, so generously continuing to support America's men and women in uniform, and their families. Thank you and God bless you. In 1999, Zach Fisher became only the second person in the history of this country to be honored with the designation "Honorary Veteran of the U. S. Armed Forces," which required an Act of Congress, and signature by the President. The only other person ever to be so honored? Bob Hope. If you would like to support Fisher House and its sister foundations in the outstanding work they do, click the link, which will take you to their web site. Please consider naming Fisher House as a beneficiary of your CFC contribution. Return to top of Heroic Actions. Read about contemporary American heroes.